Morawiecki informed Israeli Prime Minister Benjamin Netanyahu's of his decision by phone Sunday, Michal Dworczyk, who heads the prime minister's chancellery, said. Poland's foreign minister, Jacek Czaputowicz, plans to attend instead, he said. It "is a signal that the historical truth is a fundamental issue for Poland, and the defense of the good name of Poland is and always will be decisive," Deputy Foreign Minister Szymon Szynkowski vel Sek explained. Netanyahu said Thursday during a Middle East conference hosted by the United States and Poland that "Poles cooperated with the Nazis" - wording suggesting that some Poles participated in killing Jews during the German occupation of Poland. He was initially quoted by some Israeli media outlets as saying not "Poles" but "The Poles" cooperated, phrasing which could be taken as blaming the entire Polish nation. Netanyahu's office said he was misquoted. The Polish government summoned the Israeli ambassador on Friday and later said it was not satisfied with the explanation of the Israeli leader being quoted incorrectly. 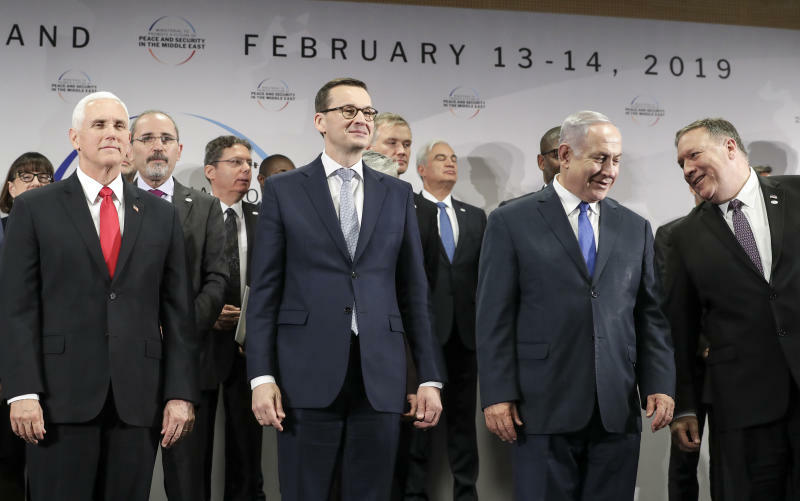 Netanyahu was supposed to meet with the leaders of the four central European countries known as the Visegrad Group — Poland, Hungary, the Czech Republic and Slovakia — during the two-day meeting in Israel. This incident follows a major spat that Warsaw and Jerusalem had last year over a new Polish law that makes it illegal to blame the Polish nation for collaboration in the Holocaust. At the height of the crisis, Morawiecki at one point equated Polish perpetrators of the Holocaust to supposed "Jewish perpetrators." Now, with general and European elections later this year, Morawiecki bowed out of the Jerusalem trip because he "has to think about the far-right and anti-Semitic electorate," said Tomasz Lis, the editor of the Polish edition of Newsweek and a critic of the government. Germany occupied Poland in 1939, annexing part of it to Germany and directly governing the rest. Unlike other countries occupied by Germany, Poland did not have a collaborationist government. The prewar Polish government and military fled into exile, and an underground resistance army fought the Nazis inside the country and tried to warn a deaf world about the Holocaust. Thousands of Poles also risked their own lives to help Jews.